I used Amber's 3rd March Viva La Verve sketch for my card today. 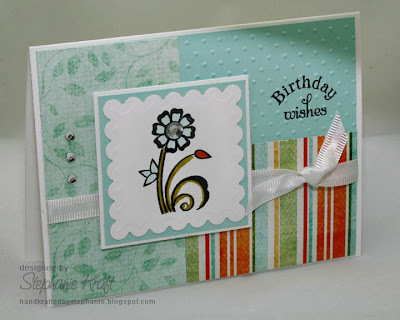 After a few days of not stamping, I found myself a little rusty -- taking a little more time here and there. I'm sure that I will get back into the swing of it shortly! The weather is gorgeous here (76 now, with a high of 88 predicted). It looks like we're skipping spring and going straight to summer! Sabrina wants to go out and play in the sand, so we're off to play outside. Hope you have a great day! Accessories: Square Nestabilities (Spellbinders), Swiss dots embossing folder, Cuttlebug (Provo Craft); Markers (Copic), ribbon, rhinestones, foam tape.